Cut persimmons in half and thinly slice. Slice or shred chicken breasts. 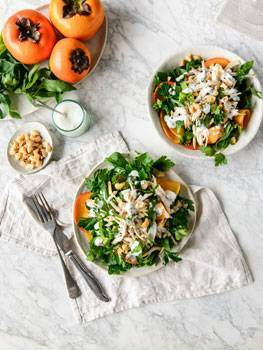 In a large bowl toss together persimmon, parsley and mint. Divide salad between four plates and top with chicken. In a small bowl combine all dressing ingredients and spoon over salad, season with cracked pepper to serve. The Australian persimmon season is underway with the first fruit arriving in stores now. This tropical fruit with a sweet honey-like taste is an autumn delicacy that is only available from mid March through to late June. Harvest is a stunning time at the persimmon orchards when the leaves on the persimmon trees turn a bright orange matching this deliciously, sweet fruit. NSW persimmon grower, Mr Brett Guthrey says it will be a bountiful season ahead thanks to a warm summer and lots of sunshine providing ideal growing conditions. 'The trees are producing excellent fruit this season. We take a lot of care when harvesting - each persimmon is hand-picked and individually placed in buckets to ensure the fruit isn't bruised, marked or pierced," said Mr Guthrey, who is also the President of Persimmons Australia. Persimmons come in two main types that have the same sweet, subtle-honey flavour but two very different textures. Hachiya persimmons, sometimes referred to as the original persimmon, are juicy and soft, similar in texture to a very ripe stone fruit. The skin of the Hachiya is a gorgeous autumnal red-orange and its soft inside can be scooped out and eaten fresh, or added to cakes and biscuits, desserts, or smoothies for extra sweetness. Hachiya persimmons need be ripe before eating, so leave them in the fruit bowl for about a week to fully ripen. They are ready to eat when they are very soft and juicy. Fuyu persimmons, sometimes referred to as the sweet persimmon, are crisp and crunchy like an apple. Fuyu persimmons have a pale orange skin and can be easily sliced. They are delicious eaten raw, as a crunchy addition to autumn salads and are perfect for cheese platters. Being firm, Fuyu persimmons are also tough enough to survive school bag bumps making them a tasty change for lunch boxes. Fuyus are best kept in the fruit bowl and will keep their crunch for 2-3 weeks before softening more like a Hachiya. 'Shoppers should start seeing Fuyu persimmons from Queensland on supermarket shelves, and Hachiya persimmons from further south will appear towards the middle and end of the season," said Mr Guthrey. Both varieties of persimmon are now available at supermarkets and green grocers around Australia. When selecting persimmons always choose fruit that is a consistent colour from base to calyx (the green bit at the top).